!Warning! This is not a fully functional skin, as it is difficult to read menu sometimes. Skin may not be suitable when using a busy desktop. Win7 does not have auto color, and system color presets too dark. Need to boost color intensity a lot! Exit CSM, restart CSM, and go to "Start Menu Style" tab. Pick Classic or Classic two columns. Pick "Crystal Haze" in Skin tab. Prepare for visual confusion, as there is no blur option. I did not make 100% clear on purpose, as white text would have vanished, if on top of white background. I usually just set to light, and have auto color on, and auto changing wallpaper on the Win8.1 desktop. Found it best to move the "Programs", and "Apps" to the right main column. Do this in CSM settings. This avoids clutter from one menu on top of the other. Set submenus to single column scroll. Turn off "jumplists" in CSM settings. Turn on white submenu option, if brain gets too mixed up! to get a bit of haze on the menu. See picture. Edit. Fixed wrong bitmap selector reference. Last edited by juniper7 on Wed May 27, 2015 9:43 am, edited 1 time in total. I dreamed about it and you made it! Obviously not the best, just realized I made a boo boo. Regular selector has a wrong size mask reference, where it should be no mask. by ommitting it, without crashing. Anything you want. White, grey, blue, black preset. Depends if you like frosty, neutral, tinted or dark grey. so I just set to auto color and have tons of pictures cycle through. It will pick the color from those. On win8/8.1, the color intensity is roughly the same. 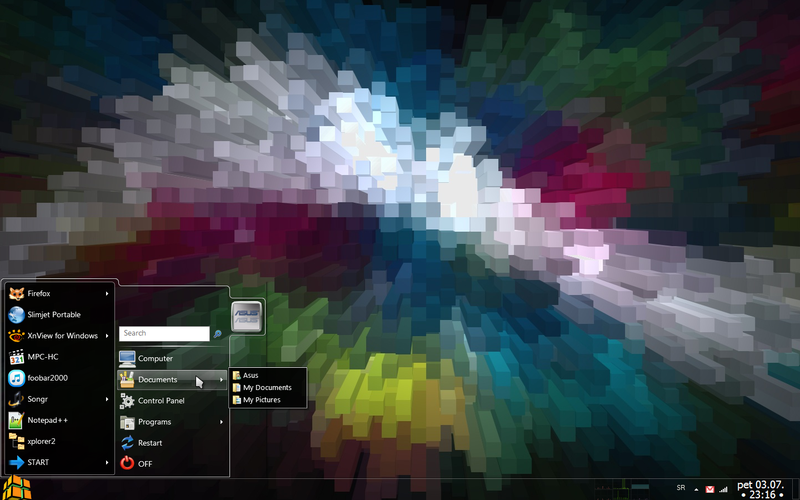 Win 7 color intensity, goes all over the place. Quite bizarre presets. For Win7 there is a program, that GauravK recomended in another post, called "AeroBlend" for auto color in Win7. It's ok, just a lot of grey, even set up for maximum color picking. For awhile, I even put the striped watermark reflection bars diagonally. Just got irritating after awhile. Can you add "Split Main Menu 2" (with black background instead of white)? Summer heat is making me so lazy. Ahhooh...ZZZz. It's not impossible to do this request, just very complex, with so many bitmaps. I'm going to replace the white with black, and rename the skin. A little easier that way. It will have black 0/255 RGB, with a little transparency, 225/255 Alpha. I did a test on one bitmap, with glass color off. With those settings, the left menu can be black 0/255 to max of 30/255, depending on what's on desktop. You can use pixelformer to change the transparency bitmaps to your taste, if not black enough. The only way to place picture like that, is to have a large invisible dead zone, on that side. This means, if the menu is showing, and you click on a folder/shortcut on desktop, in that area, nothing happens. Would you be prepared for that? Also menu shadow would have to be turned off in CSM settings. I know it can be done, with picture on side. Just have to figure it out, with some time and cool weather. For adding the black change, probably will finish maybe in one day. It's not that difficult, unless I'm forgetting something.3/4 done. Have to stop for bit. As for the picture on the side, I can get it working. See picture. means 14 new menu bitmaps would have to be made, to accommodate it. unless I spend more time shrinking down bitmaps to bare minimum. If it was Win 7 style, would be very simple. Only problem with Win7, is picture has to be in middle of second column. I will have to pass on the picture option, unless skin can be simpler. Last edited by juniper7 on Wed Jul 01, 2015 10:29 am, edited 1 time in total. Ran out of time. Kept changing it so much, as per background picture. It can never look good for every background. So I'll backtrack to what was planned originally. Oh well, that's how experments go. Splitwirez, I'm using your button-button . Thanks. Have to come clean with you. Notice the menu edges. I borrowed parts of it, from your plex menu. which is hardly noticeable. I didn't want to shrink it. Thanks. This does not have the user picture on the right edge. Nor does it have the white split menu. I replaced with a blackish one. To put every option in one skin, would amount to a couple hundred bitmaps. Sorry, don't want to do. See a later post for a simpler skin, with user picture on side. My fave is "light", with "black split", with "glass color" "enabled". Due to skin size being around 5 meg, it's a lot easier to upload/download a lot smaller file. Unzip the compressed file first, then paste it in the skin folder. I made a simpler stripped down, neutral skin for you, ZoNi. No name, No glass color haze. 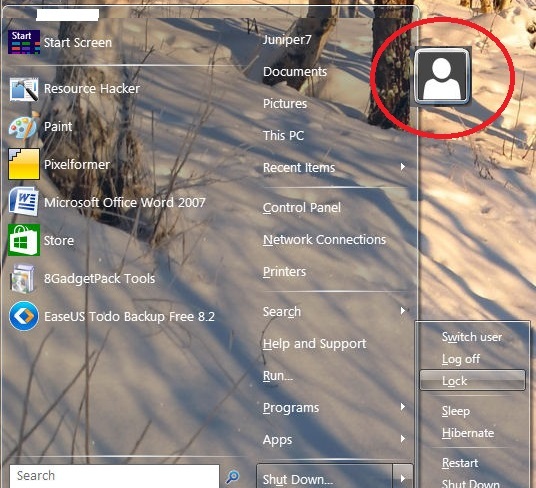 The user picture is on the side, in a folder tab look, or bare. all along the right side, when user picture turned on. Unzip the compressed file, then paste it in the skin folder. Done that, it is great now Thank you. I thought I have to disable Windows-wide "shadow" option, didn't know Classic Shell has its own setting for that.